I may not be even human being. Because, according to my mentality, I'll get the body. Maverick researcher Shaun Ellis raises abandoned wolf cubs and teaches them by example how to survive in the wild. 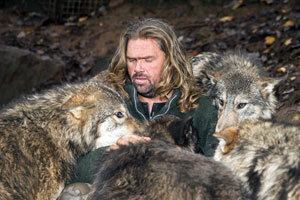 Shaun Ellis is a wolf behavior expert who conducts research in a unique and sometimes controversial way: by living with the wolves and becoming part of their world. Throughout his life, he has dedicated much of his time to studying and researching the behavior of wild wolves by living among them, which has given him one-of-a-kind insight into the complex society of the wolf. By being closer to wolves than nearly anyone else in the world, he has learned a language unlike any other. Krishna says: vedaham samatitani [Bg. 7.26]. He knows past, present, future. In the Srimad-Bhagavatam , Vedanta-sutra , it is said: janmady asya yatah anvayad itaratash cha artheshu abhijñah [SB 1.1.1]. He knows everything, nook and corner, whatever is going on, in the nook and corner of His creation. You cannot hide anything from Krishna. Mattah smritir jñanam apohanam cha [Bg. 15.15]. I may forget. But because Krishna knows that I wanted to enjoy something in this material world, He gives me the chance. "Now I give you the opportunity. Enjoy. You wanted a body like this? All right, You take this body. You wanted a body like demigod in the heavenly planet like Indra or Brahma? All right. Take this body. And if you want, you wanted a body like hog, to eat stool, all right, take this body." Ye yatha mam prapadyante [Bg. 4.11]. Whatever you want, Krishna is witness. Ishvarah sarva-bhutanam hrid-deshe 'rjuna tishthati [Bg. 18.61]. So He is noting down your desires. And He's giving you opportunity. Just like if somebody is kind upon me... Just like our Karttika is very kind. He has given me this room. If I say: "Karttika, this room does not suit me. Give me that room." "Yes, you come in. Yes, you come in." This is a question of love and affection. So Krishna is so affectionate to the living entity, whatever he wants, He's giving him. "Come on. Take it." But the owner of the apartment is Krishna. Therefore here it is said: kshetra-jñam chapi mam viddhi sarva-kshetreshu bharata [Bg. 13.3]. So the living entity's the occupier of this body. And the owner is Krishna. Therefore Krishna's another name is Hrishikesha. Hrishikesha [master of the senses]. This body means the senses. We are enjoying with this body means we are enjoying the sense gratification. My eyes, to see something very beautiful. so God has given us these eyes. See nicely. To your heart's content. I want to touch something soft. Krishna has given us. "All right, you take opportunity." Eko bahunam yo vidadhati kaman [ Katha Upanishad 2.2.13: "Although one, the Supreme Lord supplies the necessities of life to all living beings."]. This is the Vedic injunction. That one Supreme Personality of Godhead, Krishna, He is giving us satisfaction. Whatever we want to enjoy. He has given us full facility within this material world. But because we do not know what is actual enjoyment, therefore the so-called enjoyment is turning to be distressed condition. Just like a child, if he's given full freedom, "All right, my dear child, whatever you like to do." So he cannot stay in one kind of engagement. Sometimes this, sometimes that, sometimes this, sometimes that. He's not happy. But if he follows the instruction of the parents, "My dear child, you do like this, you eat like," then he's happy. If he takes the freedom in his own hand, it is not possible to become happy. Similarly Krishna has given us a certain type of body. I am the occupier of this body. And I am enjoying. But because my calculation is mistaken... krishna-bahirmukha haña bhoga vañcha karenikata-stha maya tare japatiya dhare [ Prema-vivarta ]. As soon as we forget Krishna, as soon as we forget that this body is given by Krishna, this body should be utilized for the satisfaction of Krishna... That is real sense. That is real knowledge. If I am given this apartment by somebody to live, I cannot dissatisfy him. Then I'll be asked: "Please vacate." That will be a distressed condition for me. So why people are suffering? The people are suffering because he has been given all the facilities, as he desires, but because that is his own program, it is not satisfied. If he accepts Krishna's program, then he'll be satisfied. That is Krishna consciousness movement. We are asking people to follow Krishna's program. Don't plan your own rascal program. You'll never be happy. But we are busy for rascal program. We do not know what is happening as a resultant action. That means: yajñarthat karmanah anyatra karma-bandhanah [Bg. 3.9]. If you work simply for satisfaction of Krishna, that is called yajña. Krishna's another name is Yajña. Or Vishnu. Yajñeshvara. So yajñarthe karma, that's nice. You are free from any interaction or resultant action of your karma. You are not responsible. It is very, very easy to understand. Just like in a office, if you work for the satisfaction the proprietor, then you have no responsibility, either loss or gain, you are free. But if you create your own plan and work for, under your own responsibility, then you'll suffer or enjoy. Actually there is no enjoyment. It is simply suffering. So that is going on. Yajñarthat karmanah anyatra karma-bandhanah . We are becoming bound up. We have got this body according to the karma of my past life, and again I am creating another series of karma. I'll have to accept another body and finish that karma. Again I'm creating another karma. This is going on. This is the instruction given by Rishabhadeva to his sons. Nunam pramattah. All these living entities, they have become mad, mad. We can see very easily. Whole world, wherever we... Big, big cities. They are working just like madmen. So many cars, so many flyways, so many under-subways and always busy. But kurute vikarma. They are not working very nicely. Vikarma. Karma, vikarma, akarma [duties, prohibited activity, action under the direct order of the Lord or His authorized representative]. These things are to be understood. Karma means prescribed duties. Prescribed duties. Janma-karma. Guna-karma. Chatur-varnyam maya srishtam guna-karma-vibhagashah [Bg. 4.13]. According to Vedic civilization, there are four divisions of karma [prescribed duties or occupations]. Because there are three qualities of the material nature: sattva-guna, rajo-guna, tamo-guna [modes of goodness, passion and ignorance]. So when we come to certain type of activities or accept certain type of body, Krishna is giving us opportunity. I wanted certain type of body. Krishna is giving. Krishna is giving through the agency of material nature. Karanam guna-saìgo 'sya sad-asad-janma-yonishu [Bg. 13.22]. Why the living entities having different types of body? ... Some types of body are nice. Suppose you become demigod, Indra, Chandra. That's very nice. But if you become dog or worm in the stool, that is not very nice. But we have to. Why? The reason is: guna-saìgah asya . As we associate with the gunas ... There are three gunas, qualities of the material nature: sattva-guna, rajo-guna, tamo-guna. So if we associate with sattva-guna, urdhvam gacchanti sattva-stha... [Bg. 14.18], then those who are associating with sattva-guna... This is very easy to understand. If you become a nice, educated person, good character, you'll be always welcome anywhere, good position. And if you are a thief, rascal, without any education, then your position will be different. So karanam guna-saìgah asya : if we associate with goodness of the material nature, then we are promoted to the higher planetary system where we get better comforts of life, long duration of life, so many facilities. Similarly urdhvam gacchanti sattva-stha madhye tishthanti rajasah... [Bg. 14.18]: those who are associating with the qualities of passion, they remain within this middle planetary system, Bhur bhuvah svah. And then... Jaghanya-guna-vritti-stha adho gacchanti tamasah : if we associate with tamasika [ignorant] qualities, then we degraded to a lower species of life, lower planetary system, dark planetary system. There are many planets, they are dark. As we have got a part of this planet, also, six months dark, six months light. There are so many different varieties of planets. We are wandering from different planetary systems. Karanam guna-sangah asya . And the society, the human society—not the animal society—Krishna says: chatur-varnyam maya srishtam guna-karma [Bg. 4.13]. Guna-karma-vibhagashah . So according to guna, if we are associated with sattva-guna, then that class is called brahmana. If one is associating with rajo-guna, that class is called kshatriya. If one is associating with mixed guna, especially rajo-guna and tamo-guna, that class is called vaishya, and if one is associating with tamo-guna, that class is called shudra. Chatur-varnyam maya srishtam guna-karma-vibhagashah [Bg. 4.13]. So in this way, there are varieties of life. But that opportunity is given by Krishna. Because He's witness. He's seeing everything. He is within our heart. Ishvarah sarva-bhutanam hrid-deshe arjuna tishthati [Bg. 18.61]. So in this way we are changing different varieties of life... Sometimes human being, sometimes animal, sometimes demigod. Sometimes something else. Sometimes rich man, sometimes poor man, sometimes brahmana, sometimes shudra. In this way, we are wandering in different species of life, and different position, in different planets. There are millions and trillions of planets. And there are 8,400,000 species of life. In this way, we are wandering. this is our position. So this is not very good business. Bhutva bhutva praliyate [Bg. 8.19]. We accept... Just like we have got this now human form of body, Mr. Such-and-such, very good position, very good business, very good... But at any moment, I'll be kicked out. At any moment. That is no guarantee. And again I'll have to accept according to my karma, another body where I may not get this position. I may be... I may not be even human being. Because, according to my mentality, I'll get the body. Yam yam vapi smaran loke tyajaty ante kalevaram [Bg. 8.6]. Our next birth will be settled according to the mental condition at the time of death. So that mental condition one has to practice.